It’s been a strange couple of weeks at Chelsea, what with the Africa Cups of Nations, injuries and heart ache (‘Don’t leave me Cheryl! I slipped and it fell in her! Don’t leave meeeeeee!’). Avram Grant has barely had eleven players to pick. And when you consider that one of those players is the goal-shy guinea-pig chomper Claudio Pizarro, the fact that the wins just keep on coming is frankly remarkable. 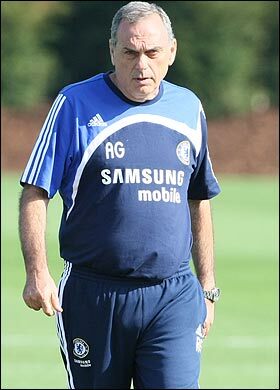 No wonder Avram has been demanding people ‘R-E-S-P-E-C-T’ him a bit more. But to be fair, The Toad (as we lovingly like to call him on Chelsea Pies) deserves a yacht load of respect from the Chelsea public. If The Special One had been in charge over this period, yes the results would have probably tinkled in much in the same way. However, Jose would not have got to Wembley/touching distance of Arsenal/the FA Cup fifth round quietly. Referees would have been screamed at, African managers would have been undermined, and no doubt a few dozen million extra might have been spunked on players Chelsea don’t really need. The fact that The Toad has sailed through this period showing quiet dignity, certainly should make everyone (as one Chelsea Pies commenter put it) ‘Respect his authoritaaaaa!, much like Cartman from South Park. Plus thereâ€™s the fact that on Monday Avram managed to get Diego Maradona to drop in at Chelsea during his current World Tour of evil leaders. Maradona has recently booked time to see Fidel Castro (formerly evil), Hugo Chavez (officially evil), Avram Grant (looks evil) and Mahmoud Ahmadinejad (Iranian evil). Perhaps this is a sign everyone should respect Avram or fear an evil wrath (this is presumably how Petr Cech ended up running around in front of Grantâ€™s special guest wearing only his pants and cauliflower keeperâ€™s hat).